Final Markit France Composite Output Index at 43.2 (48.0 in August), 42-month low. French service providers reported a steeper decrease in business activity during September. The latest fall in activity reflected a considerable drop in incoming new work. Companies adjusted staffing levels down accordingly, leading to an accelerated drop in employment. Input prices rose at a sharper rate but output charge discounting gathered pace, highlighting a deepening squeeze on companies’ margins. Future expectations meanwhile dipped into negative territory for the first time since February 2009. The seasonally adjusted final Markit France Services Business Activity Index – which is based on a single question asking respondents to report on the actual change in business activity at their companies compared with one month ago – posted 45.0 in September, down from 49.2 in August. The latest reading pointed to a marked rate of contraction in activity and the fifth decline in the past six months. 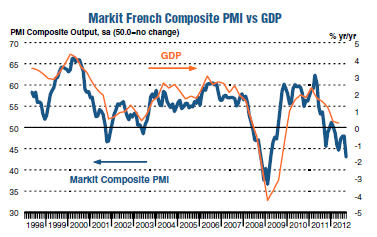 The seasonally adjusted final Markit France Composite Output Index – which measures the combined output of the manufacturing and service sectors – registered 43.2 in September, down from 48.0 in August. The latest reading was indicative of a substantial decline in activity and the steepest rate of contraction since March 2009. Service sector activity declined in response to a further fall in new business during September. The rate of contraction in new work accelerated to the fastest in five months, with anecdotal evidence pointing to lacklustre demand conditions and clients delaying decisions on projects. Combined with a steeper decline in new orders in the manufacturing sector, overall new business across the French private sector fell at the steepest rate for 41 months. Reduced workloads prompted French service providers to make further cutbacks to employment during September. The rate of job shedding accelerated to the sharpest for 33 months, with panellists indicating that staffing levels were lowered in response to declining activity and as part of cost-cutting efforts. Composite data signalled the sharpest reduction in employment since December 2009. If that does not accurately describe implosion, what does? Looking for who or what to blame? Look no further than inane work rules and regulations made worse by the socialist government of president François Hollande. If socialists take control of both houses in French parliament as expected, president François Hollande would have free rein to carry out his stated policies such as hire more public workers, raise taxes on the rich, and Wreck France With Economically Insane Proposal: "Make Layoffs So Expensive For Companies That It's Not Worth It"
Well, three months have passed and the French economy is clearly imploding and Hollande has not even fully followed up on his economically insane promise regarding layoffs, but he has pressured companies to not do so, and he has also massively raised taxes (a splendidly stupid thing to do in recession). You reap what you sow, and the implosion of France is now underway. Odds of France making its budget projections are in my estimation close to zero, but time will tell.